In pharmacokinetic analysis, the iMScope TRIO enables the distribution of unchanged and metabolized drugs to be simultaneously mapped in a single measurement, without any labeling. The laser diameter used during mass spectrometry imaging with the iMScope TRIO is continuously variable from 5 to 200 μm, offering low to high spatial resolution. This helps ensure that analyses are performed as efficiently as possible. Using a mouse administered with olaparib, the pharmacokinetic status of the tumor was visualized. In this way, imaging mass spectrometry is being utilized even in the clinical trial phase of drug discovery, rather than only during basic research. 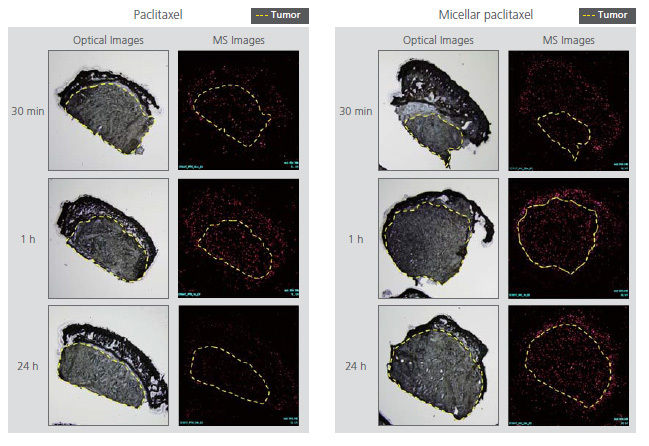 This shows that micellation of the known anticancer agent paclitaxel improves its retention within the tumor. Consequently, imaging mass spectrometry is being utilized for DDS research as well.